GTalk Password Finder is a utility for finding and recovering Google Talk messenger passwords that are stored on your computer. Like many other Google applications Google Talk can save your Gmail password on your local computer when "Remember Password" checkbox is ticked in GTalk instant messenger. GTalk Password Finder is a utility for finding and recovering Google Talk messenger passwords that are stored on your computer. Google Talk Password Finder allows to find passwords from Google Talk messenger multiple profiles. 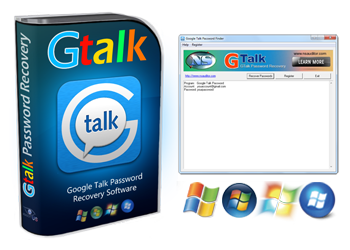 GTalk Password Finder is the best tool for finding and recovering Google Talk messenger passwords. Like many other Google applications Google Talk can save your Gmail password on your local computer when "Remember Password" checkbox is ticked in GTalk instant messenger. Google Talk Password Finder utility can be useful if you lost your Gmail password. With Google Talk Password Finder can retrieve passwords from Google Talk messenger multiple profiles. Google Talk Password Finder is the easiest to use toolkit on the market.